Shoe Size guide: See the size conversion table to know your correct shoe size. Choosing the right shoes isn't just a question of choosing the right style, it's also about choosing the correct size. Too big, a bit tight, lacking support: When the size isn't right it's hard to be comfortable. Below you will find tables to enable you to compare the UK sizes with the EU, Italian and US sizes, our sizing advice. 1 In socks, stand against a wall on a piece of card or paper. 4 Measure the distance in centimeters between the edge of the card and the line you have drawn (round up to the nearest millimeter). Welcome to the world of little feet! 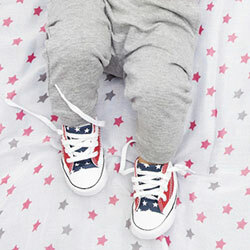 During the 1st few months of a baby’s life, shoes serve to protect against cold or against possible shocks. The idea that a shoe will help a baby to stand by themselves more rapidly is incorrect. For a baby, shoes are foreign objects that take some getting used to. A leather upper and lining; the only material that "breathes" and prevents allergies. A non-slip sole of 1 cm thickness max. It must be strong, but not rigid. A shoe that rises up the ankle but that is flexible. A reasonably firm heel to hold the foot and keep the baby stable. A good tongue length to protect and support the instep of the foot. Be careful not to fold it when tightening the laces which could hurt a baby. A shoe which you can vary how tight you close it (preferably laces). Avoid secondhand shoes; the shoe will have molded to the shape of the previous owner’s feet. First steps: ready for an adventure! Towards the age of 10 months, once a child starts to stand that it’s important to start thinking about shoes to walk in. Once a child begins to stand, the foot has to support the entire weight of the body, so the muscles in the feet develop and the arches form. The best shoe for this period? Neither too heavy nor too rigid nor too high-rising, with reinforced but flexible soles. They must be comfortable above all, protect the foot and give the child a better stability. If they are not suitable, the balance needs when learning to walk may be affected. Young children's feet grow by 2 to 3 sizes a year, and then by 1 to 2 sizes a year from the age of 5. Children feel little or no pain if their shoes are too small because their bones are still soft. This is why we need to regularly check the shoes they're wearing. If they're too small, the front of the shoe will start to become misshapen because of the pressure of the child's toes, and sometimes the lining will tear. This means they need a bigger size. A child's foot should be supported by their shoes without being constricted. If you can get a finger between your child's heel and the back of the shoe, this is a good indication that they're wearing the right size. This gap allows for growing room and thrust (the forward movement and bend of the foot in contact with the ground). Learning to walk? Easy! Now, your child runs, jumps, dances and climbs without a problem! From 3-5 years old, movement and energy expenditure are without limits, and children subject their feet to stress every day. This only continues once your child starts school and hits the tarmac of the playground. Shoes should be, above all, resistant and very comfortable! Up until the age of 12, even if your child has big feet, it is recommended that you choose children’s shoes. At this age, they’ve not finished growing and adult shoes may not provide the support needed. First things first, measurements! Consult our product pages for information about heel height, calf width and the height of the boots. To measure the height of boots, we measure the length from the heel to the top of the boot. To measure the calf width, we put the boot down flat, measure the widest part of the boot and times by two. Pour anyone having difficulties finding boots for wide calves, select the filter 'wide calf' on the left hand side of the product lists under 'comfort'. Sarenza also offers a selection of stretch and lace-up styles which adapt perfectly to all body types. If you are still not certain if the boots will be the perfect fit, you can return any unworn item, free of charge for an exchange or full refund. Wearing heels take practice, and they absolutely have to be comfortable! Most women prefer quite a broad heel, 3-4 cm high, which will provide better balance than a narrow heel. But if you can't do without your stilettos and you've mastered the art of the elegant, slinky walk, then indulge yourself with our 9 and 10 cm heels for a special occasion or simply a great girls' night out. It might be an idea to have a pair of ballet pumps ready for the end of the evening though… And finally, don't forget to alternate wearing flats and heels for the sake of your feet and your comfort... not forgetting your back and your joints! Similarly, if you do suffer from backache, choose shoes with a small heel (approx. 1.5 cm) rather than shoes that are completely flat.